Aegon N.V., incorporated in 1983, is a multinational life insurance, pensions, and asset management company headquartered in the Netherlands. Aegon Asset Management (AAM), the company’s investment arm, manages most of the company’s assets. The Company offers protection against mortality, morbidity and longevity risks, including traditional and universal life, in addition to endowment, term and whole life insurance products. It offers supplemental health, accidental death and dismemberment insurance, critical illness, cancer treatment, credit/disability, income protection, travel and long-term care insurance. It offers a range of specialized mutual funds, including asset allocation, the United States equity, global/international equity, alternative investments, hybrid allocation, fixed income and target date funds. In addition, the Company offers retirement plan services to employers across the entire spectrum of defined benefit, defined contribution and non-qualified deferred compensation plans. It offers services to individuals rolling over funds from other qualified retirement funds or individual retirement accounts (IRAs). In Brazil, the Company offers life and critical illness insurance; private and company pensions; pension scheme administration, and investment funds. In Mexico, it offers individual life, group life, and health insurance, and saving plans. The Company offers products with mortality, morbidity, and longevity risks, including traditional and universal life, in addition to employer, endowment, term, whole life insurance products; mortgages; annuity products, and banking products, including saving deposits. The Company offers individual and group pensions usually sponsored by, or obtained through, an employer. It also offers general insurance, consisting mainly of automotive, liability, disability, household insurance, and fire protection. The Company offers individual protection products, such as annuities, term insurance, critical illness, income protection and international/offshore bonds. The Company also offers individual pensions, including self-invested personal pensions and drawdown products, such as guaranteed income drawdown products, and group pensions, sponsored by, or obtained through, an employer. Also includes the tied-agent distribution business. The Company has activities in the Czech Republic, Hungary, Poland, Romania, Slovakia and Turkey. This business line includes life insurance, individual and group pension products, savings and investments, in addition to general insurance. The Company offers life insurance marketed to high-net-worth individuals in Hong Kong and Singapore. It also offers a range of direct insurance solutions from product design, customer analytics insights, marketing campaign design and multi-channel product distribution to policy administration and claims management. The Company offers investment products covering third-party customers, insurance-linked solutions, and its own insurance companies. It offers fixed income, equities, real estate and multi-asset solutions to its own insurance companies. It operates asset management activities in Central & Eastern Europe and Spain & Portugal, in addition to results of the asset management holding. Aegon’s world headquarters in The Hague. The headquarters office of Aegon is located in The Hague and designed by OTH Architects. Initially AEGON wanted to redesign only the conference rooms, but while working on it they decided to improve and redesign the full building. The office spaces, the main hall and the restaurant were redesigned. The new design has a lot of glass like glass walls manufactured by SI-X. The restaurant has a main helical staircase with a full glass balustrade manufactured by Eestairs and did win the prize for the best staircase of the year in 2008. 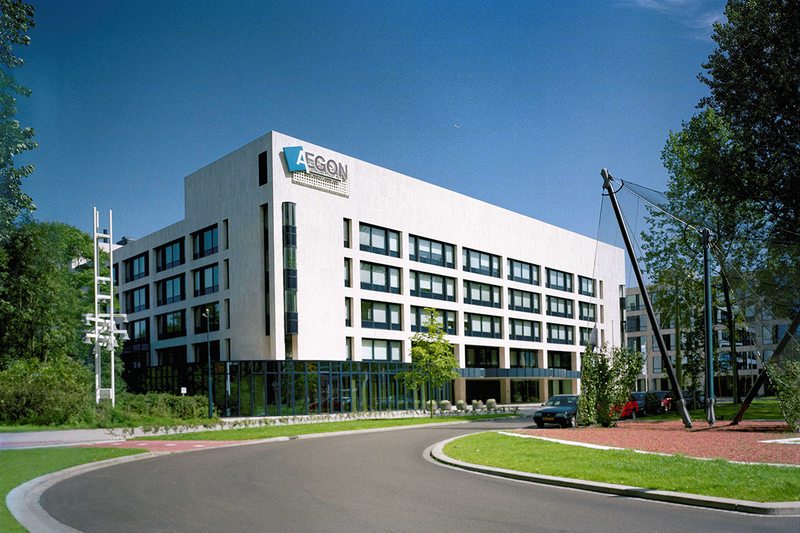 In 2009 Aegon decided to buy this building from real estate fund Unibail-Rodamco and keep the building as their headquarters.